Ever come home to an empty refrigerator after an extended trip? Yeah? Me too. I cleaned all of my perishables out prior to departing for the Tetons, Yellowstone, and Utah earlier this month, and when I woke up ready for breakfast the day after I got back, my heart sank. My fridge was, save condiments and a container of almond milk, devoid of food. I'm an eggs-for-breakfast-every-day person and that morning, I was egg-less. Then I remembered I'd received a Just in Case Breakfast Assortment Bucket from Mountain House to test. Less than ten minutes later, I had re-hydrated scrambled eggs and bacon ready. I've used freeze dried meals backpacking for ages, but it never occurred to me that the packages I rely on to get me through trips could have another purpose. Mountain House came up with their "bucket" offerings in a response to a growing trend in the emergency preparedness supplies business. Rather than buying and storing canned foods, which never taste quite right and expire relatively quickly, freeze dried meals can be an ideal choice for long term food storage. If the power goes out, if you're snowed in like we were in most of the northeast last week, or if you come home to an empty refrigerator after a long trip, it's good to be prepared. As I trend in the Paleo direction, I stuck to the Scrambled Eggs with Ham and Peppers as well as the Scrambled Eggs with Bacon pouches for testing*. Freeze dried eggs are usually hit or miss in my experience, but after following the directions precisely, I found both scrambled egg options pretty tasty. Essentially, you boil one cup of water, open the pouch, take the oxygen-absorbing iron powder packet out (the packets are non-toxic, so if you forget to remove it, you'll be okay, simply take it out of the re-hydrated food and discard it), dump the water in, stir everything up, reseal it and wait for the designated amount of time. After re-hydration, the eggs had a slightly spongy texture, but with the added bacon, ham and peppers, both pouches made great meals. Great enough, in fact, that I've already eaten two of each at home; so much for saving the pouches for emergencies. And though some of the pouches are designed to have more than one serving, one full pouch is the amount I need fill up. The clear bucket itself is an easy way to store a variety of food and other emergency items. Half of the lid flips up for easy access while the other half stays attached to the bucket itself to help you avoid losing the lid. I could easily fit a headlamp, matches and other emergency supplies in the bucket. Given I usually camp with friends, I can see the buckets being an easy way to take food along for groups. As a note, if you're keeping them on hand for emergency preparedness, it's a good idea to store the 16 cups of water required to rehydrate all 16 packets with the bucket. 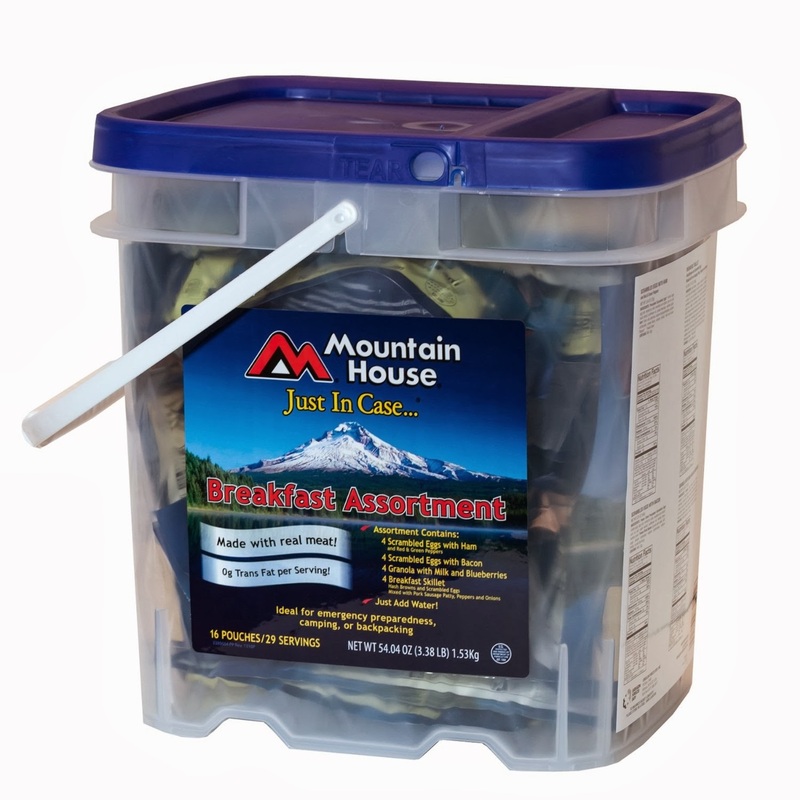 Win a Mountain House Just in Case Breakfast Assortment Bucket! * As my dietary needs are by choice, not due to allergies, I'd likely eat anything I had available in an emergency! But for those of you following a strict Paleo prescription, technically, none of the pouches in the breakfast assortment bucket are 100% Paleo. However, both scrambled eggs pouch options are gluten free. This would be so sweet! I've come to actually love Mountain House Meals when I'm out on the trail and what a great idea for an emergency. Generally I just eat instant oatmeal for breakfast so scrambled eggs would be AWESOME! Thanks Katie. Hard to beat granola with blueberries! Great for backpacking and emergencies. Not a bad variety either. Oatmeal, with fresh or dried fruits...mmmmm! Great assortment in that bucket! I've used some of their other buckets which contain entrees and they are great too! I would love to try more of the breakfast item you offer. I normally eat the diner meals and skip breakfast....time to try new ideas for breakfast. That's what got me started with freeze dried meals, Beth! I was sick of the same old stuff. The smell of bacon should, in my opinion, be enough to tempt anyone into a backpacking trip! Thank Mountain House, Andy, and thanks for the comment! I used to do that too, hope you get a chance to try out the meals! Agreed! The variety of options, even in this bucket, is great. I love the lunch and dinner options too! Trail food can be trick when you're Paleo for sure! Two of the options in the case are Paleo-friendly, mostly, but there are some ingredients on the list for these items you'll want to be sure you know about for sure. I'm sensitive-ish to gluten and soy too, but can handle both in small quantities. Both of the scrambled egg options went over just fine! Isn't it great? There really is something for everyone, especially those of us who like more traditional breakfast foods. I'll have to give the other buckets a try too! No more skipping breakfast! :) Good luck with the giveaway! I almost always have Mountain House eggs and bacon on the trail. Lately, I've been supplementing with Bacon Jerky from Oberto. If I found some bacon-flavored coffee, I might do that, too. Honestly I was always wary of powdered eggs, but this review has changed my mind about trying them! I'm normally a paleo eater too at home so having eggs for breakfast when hiking sounds *amazing*. This thing is awesome, and on the trail I like anything as long as I have my french press coffee from my jetboil! 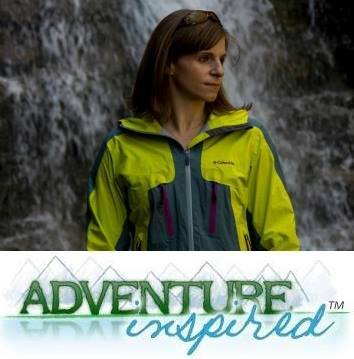 I go for instant coffee (Starbucks Via) and granola for breakfast while on the trail. Never had any of the MH products. Just received a few items (dinners/deserts) as stocking stuffers. Hoping to try them out soon. I've been wanting to try MountainHouse for a while now, but keep putting off grabbing some. Hope to get some soon! I like oatmeal with dried fruit. I love Via for backpacking, so easy to carry around! Awesome! I'm excited to hear what you think when you try them. I eat granola for breakfast. Love Mountain House Meals. Light and tasty, great meals in the back country. My favorite breakfast option is usually a PROBAR because it packs plenty of calories and tastes great! I absolutely love the granola with blueberries, but there isn't much from Mountain House I don't like. I would LOVE to win this. Gotta get a good start to the day! My favorite breakfast option is something with some carbs and fruit. Granola seems like a perfect choice! Usually some granola or oatmeal starts me off and gets me going. I like the blueberry oatmeal or the western omlette choice. Granola energy bar, dried fruit, nuts, water. You may want to change your wording. It is not "dehydrated" it is "FREEZE DRIED" which lasts a lot longer and tastes a lot better. Wouldn't want to confuse your readers. Wow, this would be a great win. used them for years, have never let me down.Weither its for something different, power black out or having to live at work (911 dispatcher) during a snow storm. PROBARs are awesome, good choice! That's pretty much my breakfast every day at home. Good choice! Nice, I've never tried those. Thanks for the heads up! Seems to be a popular option, awesome! Warm options are so great in the winter too!